The Oscars are always a fun night for me. I adore movies and this year there were a plethora of good ones, some even great. Jerry and I saw most of the nominated movies, although we (sadly) missed “Winter’s Bone.” There were not a lot of surprises in the results but I was happy with way more decisions than I usually am. It was a tough year because there were so many great performances. I thought Cate Blanchett looked incredible in her Givenchy haute couture. It was sculptural and almost acted like a frame for her tall, elegant body. It was a dress that I think people will either love or hate. I love. 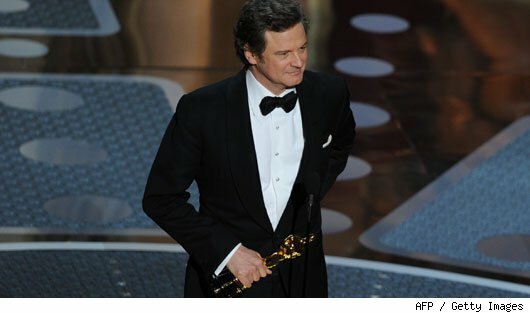 Colin Firth, who won best actor for "The King's Speech." I’ll bet Colin Firth, who is so divine to look at regardless of what he is wearing, was almost certainly in a Tom Ford tux. I love the studs – wish I could have seen them up close. We first saw Anne Hathaway on the red carpet in this gorgeous Valentino archival gown, standing alongside none other than Valentino himself. Even Tim Gunn seemed a little star struck. She then wore SIX different gowns during her stint as co-host of the Oscars. There was a white strapless number with a combination of Grecian draping and structured beading, a black and silver beaded number, a one-shoulder gown, a red beaded gown, a royal blue off-the-shoulder gown and finally a silver and pewter form-fitting gown and elegant chignon. Her hair and makeup people must have been going crazy backstage because each gown came with a different hairstyle and slightly tweaked makeup. She must have had a fabulous time shopping for weeks on end to select all those gowns. Or perhaps all the work was done by her stylist? Which was your favorite of Anne’s Oscar looks? Nicole Kidman never misses a beat, does shoe? This Dior Couture column gown with art deco-inspired beading and embroidery is simply perfection. And, hey, those red peep-toe shoes are so unexpected and so perfect! Didn’t she look happy with Keith Urban, her favorite accessory? This lavender Elie Saab confection may not work on many women, but I thought it was perfect on Mila Kunis. Her hair and those fabulous diamond earrings all came together so beautifully. One thing always saddens me about the gowns worn at the Oscars: They will be copied and within a matter of weeks cheap knockoffs will arrive in stores. I once interviewed Alan Schwarz of ABS and he said that he has a team of a dozen designers who sit in front of TV during the Oscars and sketch each gown. Within two weeks, he said, they have sample knockoffs ready for their manufacturers. As a former designer, that just breaks my heart. Whose Oscar looks did you love….or not? This entry was posted in International fashion and tagged Anne Hathaway, Cate Blanchett, Colin Firth, Mila Kunis, Nicole Kidman. Bookmark the permalink. Anne Hathaway was surely dressed by Rachel Zoe. Several friends on Twitter mentioned that Zoe’s name was in the Oscar credits as the award show stylist. Ohhhh, she looked so incredible in every gown – and tux! If it was Rachel Zoe, hats off to her!